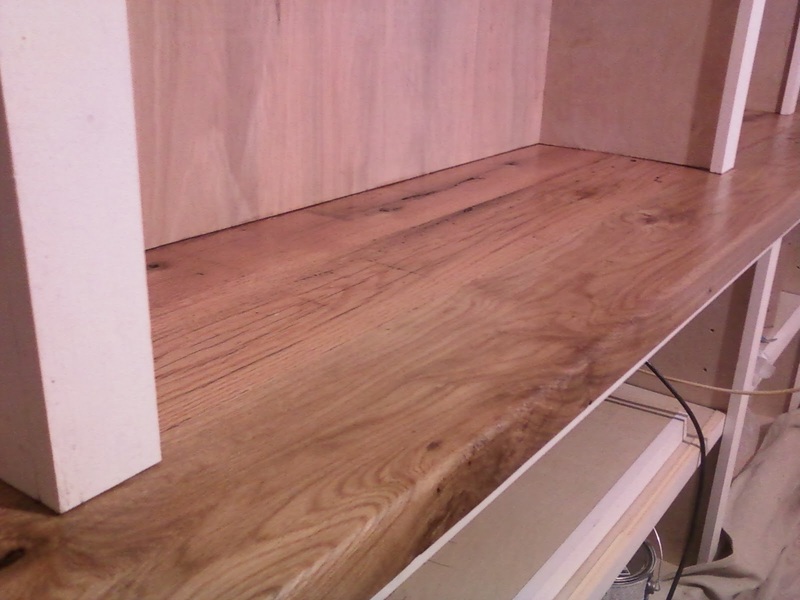 So, I had a quote from a guy to finish my reclaimed red oak counter top made from a downed barn. It was like $500 (+ materials) to do some hand scraping, 10 coats of a shellac, some wax, etc.. the whole nine yards. 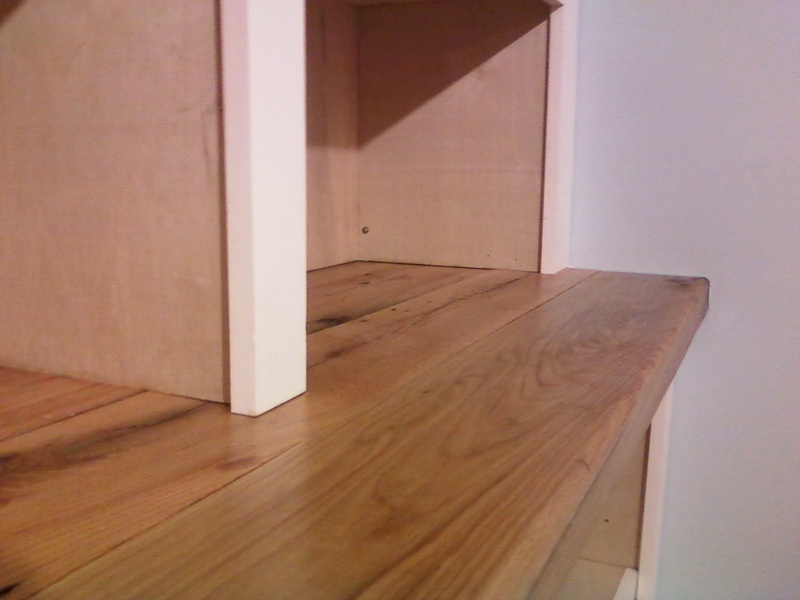 Since I've gone a little over budget with this renovation, I decided to DIY another aspect of the project: the counter. The trouble is: I don't know anything about finishing wood. I think some of my friends think of me as some high-end, specialty woodworker, but I have them all fooled. I don't know anything. I just like to figure out the math, angles, and how to fit things together. Sometimes, I do this with wood. Truth be told: I'm really more of a metal shop guy. I like the tighter tolerances and precision that comes with metal working. Woodworking can quickly get into reading grain, growth rings, all kinds of organic crap that I can't control. The inexactness is annoying to me, and my eyes start to glaze over with boredom when trying to learn about something that is impossible/hard to predict. The internet is like a giant circus. It like a royal rumble on how Person A's method of finishing oak is better than Person B's. And, that better method gives Person A the liberty to berate and belittle Person B's inferior method. I'll read through these long message board posts and instead of learning something I wind up feeling 1) more confused and 2) ashamed that I come from the same species as these angry people. I'm not talking big box stores either, even though that subject could warrant its own series of unflattering posts. Philadelphia doesn't really have a real woodworker supply place (that I know of), so I went to the local yards and paint suppliers who all have decent sections on finishing wood products. I didn't get much help. I had a sample off-cut with me and everything. One thing that everyone seemed to know is that you don't want to use polyurethane on anything that you will eat off of. I'm glad I had their help. I wish someone would have warned their parents about the dangers of eating off of polyurethaned counters. Thus, I had to figure it out on my own. I had some water-based poly at home, and I also picked up some of the more expensive oil-based poly at the yard. I tried them both. The wood is beautiful on its own. Sure, it has some knots and wormholes, but it could really look finished as is with no product application. Thus, I figure I don't really have to do much in order to really make this thing looking finished. That means stains are out, and some of the long-curing processes are out as well (due to timing). I'm not really a big fan of polyurethane, but I can basically brush this stuff on, sand, re-coat, and I'm done. At this stage of my existence, I like that idea. Oil turns the wood that yellow/orange warm color as well. I think that will go over well. Let's go with oil. Since I'm completely out of time (and the old lady wants me done---no matter what), let's just slap this crap on and hope it doesn't ruin the counter I've sunk a ton of man-hours, money, vacation time, and sanity into. 1) Soul-stealing, demon-seed cat behind me. Waiting to walk in my poly. There is lots more to write. The house has gone through some major transformations since the last post. Its amazing what you can achieve when you just stop sleeping. I apologize for the excessively sarcastic post, I think I'm just cranky. The house looks really good. Lots of loose ends still, but no more then we are used to here at the site. 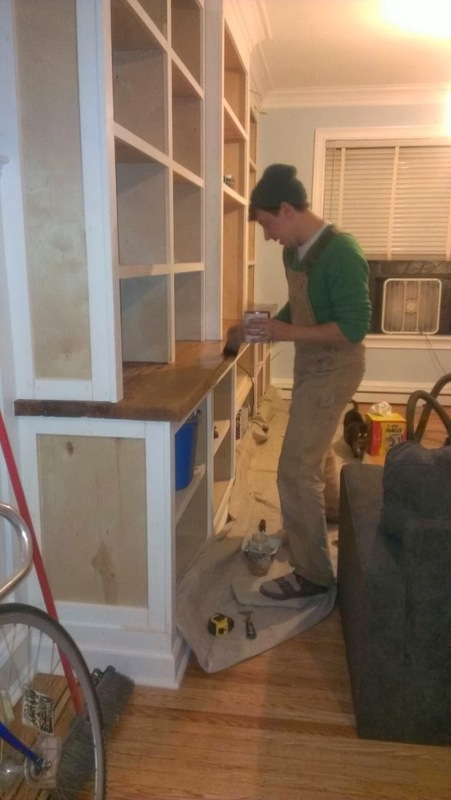 Final cost of finishing the counter?